We all have different choices when it comes to comfort food. Comfort foods are usually simple and have a nostalgic feel to it, depending on culture and taste. It is something which we all have grown up on or find it most easy to digest on a tiring day. Some would treat comfort food as therapeutic depending on factors like stress or health. We always associate food to circumstances and comfort food is one amongst them. We also indulge in festive foods albeit occasionally. What is so special about comfort food? Why am I stressing on it so much…. In a lifestyle like ours where we forget to eat or manage our time well because of the rat race. It is important that we manage or plan what we eat! Veggies and organic foods are good for us but are we looking beyond what is REALLY comforting. For me a simple rassam or pepper water maybe comfort food and my friend may find a cake his/her comfort food. We all have our levels of satisfaction and it is only YOU who can tell yourself what comforts you the most.Let me leave you with this thought, even simple things or food for that matter can change your life into better living. 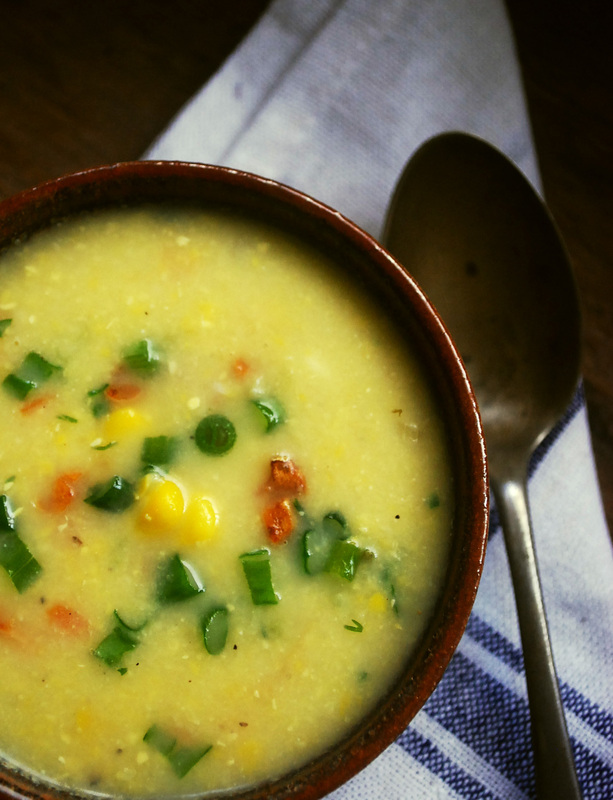 Corn chowder is a one pot meal and I consider it to be my comfort food :). 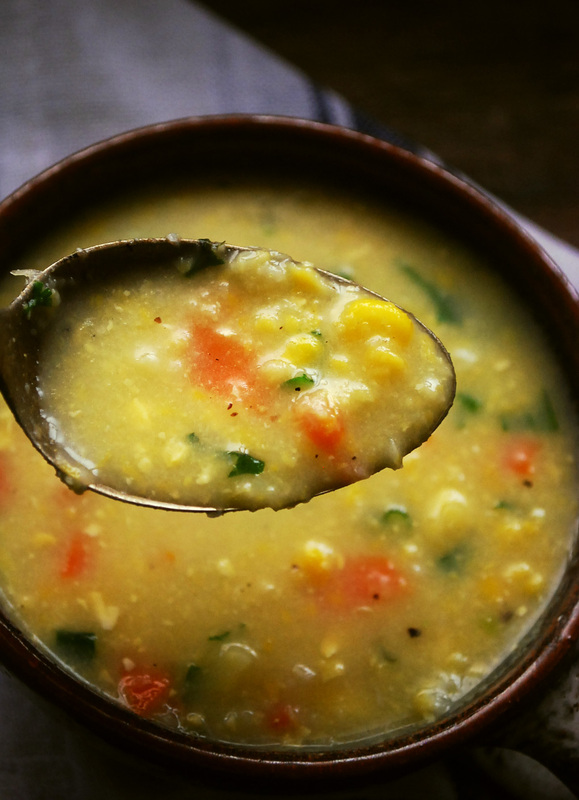 It is a soothing combination of corn, potato and carrot flavoured with some herbs and olive oil; which makes it a simple soup for dinner. I always end up thinking what to make for dinner at the last minute and find this recipe handy. Grind the corn kernels along with garlic in a mixer, coarsely.Heat oil or butter in a pot. Saute onions until soft and add potato, carrot and salt. Cook until soft. Add the corn puree, some water (maintaining thick consistency) and bring it to a boil. Simmer the gas and cook for 5 minutes. Check for salt and add pepper. Serve hot garnished with some corn kernels and spring onion. Serves 2. You could also garnish or flavour the chowder with cheese, fresh or dried herbs, roasted garlic, free range or organic chicken or eggs. Bon Appetite! My name is Megha from ‘i2cook’. Yup I’m the one who makes peanut butter and other organic products. You can buy my products online. I’m a guest author on Natural Mantra and will be posting all things healthy. I don’t mind being assertive when it comes to talking about all things healthy/organic that are good for you. Feel free to share your thoughts. There’s always room for a little improvement…..what say? Categories: Healthy Recipes | Tags: comfort food, healthy living, sweet corn | Permalink.